Devotees of Krishna are described as having twenty-six key personality traits, such as humility, truthfulness, desirelessness, and indifference to material acquisitions. An acharya, empowered spiritual teacher, is one who possesses all these qualities to an extraordinary degree. 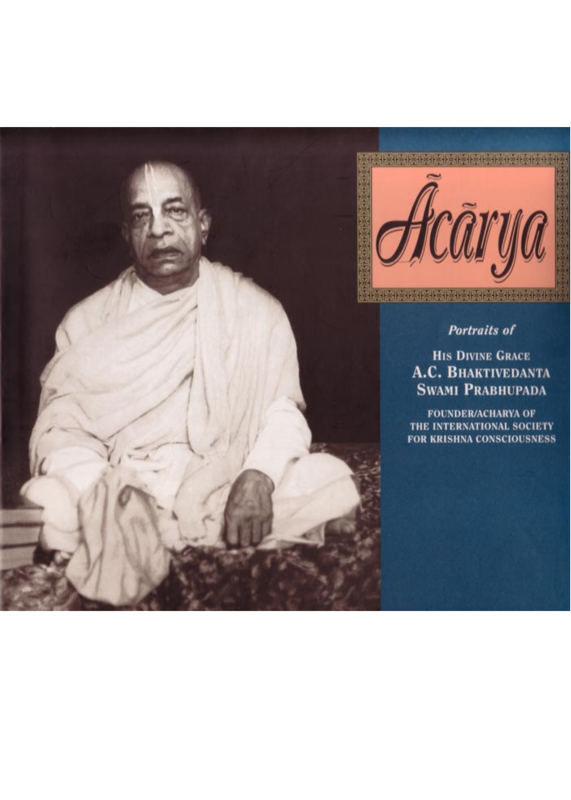 This book, simply entitled Acharya, juxtaposes twenty-six photographs of His Divine Grace A.C. Bhaktivedanta Swami Prabhupada with pages of text expanding on each of a devotee's transcendental qualities. Since the face is the index of the mind, when each photograph is considered in relation to the accompanying text, readers can experience a rich meditation on the inner life of this twentieth-century saint. Recommended companion volumes are the Prabhupada Lilamrita, as well as the Twenty-six Qualities of a Devotee, both by Satsvarupa dasa Goswami.